Whilst on one of our pack walks, I was admiring a couple of our dogs that were rescued by their owners. I’m always so proud to help rescue dogs with social issues. Some of them had little to zero exposure to other dogs, let alone a pack walking together. 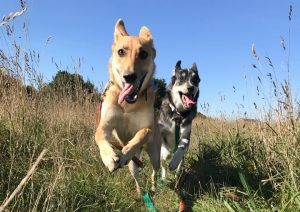 The majority of my rescue dogs needed a lot more care, patience and attention on their first few walks but it’s certainly worth all the work once you witness them being a happy content dog. With that in mind I asked some of my rescue customers to write their dog/s story, how they chose them, how they managed the transition from rescue centre to their new home and if they would recommend the experience to others. I shall supply all contact details of adoption centres at the bottom of this blog entry. We never intended to have a dog, but I was told about a dog pound in Quinton. I went to see all the dogs on my own because my boyfriend (now husband) was in bed suffering the flu. Blondie was in the very last cage and I instantly knew she had to come home with me. I called Darrell to “TELL HIM” I’ve found us a dog. He tried (bless his heart) to put his foot down but I sent him a photo of her, and he quickly gave in. She radiated that kindest nature and I fell straight into her eyes. I couldn’t believe she was a stray let alone a dog that everyone passed by in the kennels. She just seemed so very sad. She didn’t really come with any background as she was found as a stray. The poor girl was skin and bones, her teeth were in terrible condition and her back obviously sloped as she walked. I was certain she was 10yrs+ due to her ailments. We obviously didn’t particularly want a poorly/disabled dog, but it was already too late as she had our hearts. We took her straight to our vet for her vaccinations and check-up. I informed the vet instantly that we had just rescued her and hadn’t even gone home yet. We didn’t have to tell him where we bought her from as he had already guessed. As Blondie was checked over she had so many issues. It would be easier to list. • Periodontal disease (bad teeth and gums which can cause pain when eating and/or chewing) This certainly explained why she was so skinny. After being informed of all these issues I dramatically asked, “how long do you think she has left to live?” Blondie was in fact only 2 years old although due to all her issues it would be highly unlikely, she would reach 10 years old. As we rescued Blondie from a dog pound we didn’t (Blondie included) the typical treatment you would receive from a rescue centre/charity. On the same day I met Blondie I handed over £75 and then we left. Our home wasn’t checked and no background checks on my husband and me. I found this odd but at the time I was just desperate to get her out of there so didn’t question anything. The first 4 weeks with Blondie were very worrying. The parvo virus and kennel cough were so severe she almost died. I would cook rice and fresh chicken breast into a puree for her. She wouldn’t eat from a plate or a bowl. Only my hand. I also used a syringe to keep her hydrated. I would coat the end of the syringe (no needle obviously) with peanut butter or pate and she would slowly lick as I would drip water into her mouth. We did this every 2 hours. YES!!! We were extremely exhausted and worried about her but eating/drinking little and often was the only way she was going to survive. 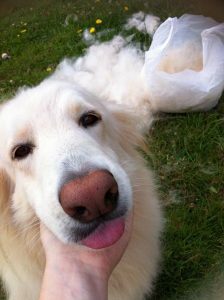 Once her health had finally improved we saw a more playful Blondie who LOVED her walks. 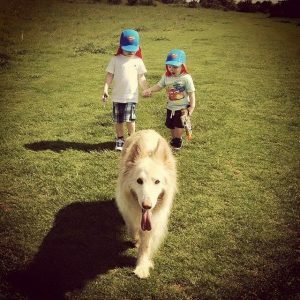 She was perfectly behaved with other dogs and loved children. Luckily really as Darrell and I had two sons after we brought her home. We only had Blondie for 6 years in the end. 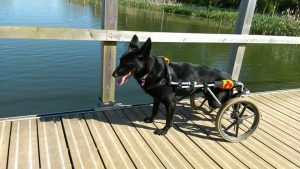 She only reached 8 years old before the hip dysplasia and arthritis became too painful for her. We had also stressed every avenue for pain killers too. So we made the difficult decision to put Blondie to sleep. As much as the first few weeks of Blondie’s life with us was hard work. Not just physically but emotionally too, it was worth it. We gave her the best 6 years and went on such fun adventures as a family. When I think back to my children being young there’s not many memories without Blondie in them and I love that. I would highly recommend considering a rescue. It does wonders for your soul. I was having a difficult time at work (not everyone knows this but I’m ok now), and had been thinking it was gone to reassess and consider what’s important in life. Like time with family and opening our hearts again to a new furry maybe. 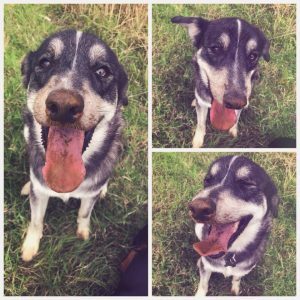 I nonchalantly began looking at local rescue centres and cane across Wellingborough Dog Welfare (Wellidog) and there he was…called Mikai with that smile. I closed the next day to enquire if you could visit to seethe dogs and was asked if interested in any dog in particular. I mentioned Mikai (Monty), but truly had no intention of just looking at him….the rest you know. That evening we had a home check and arranged for Monty to visit at the weekend to meet the other furries…namely two cats! Oh and the old lady dog, Rubi, who’s his best pal. That visit went ok. He’s good friends now with Murray…not so much with Lily…the feisty one. He wants to love her, she’s not so keen 😂. Then began the visits to him, every day for two weeks and brought him home for “lunch dates”, got to know him, took walks and showed him that we were going to be good together. His story is somewhat vague. I was told he came to Wellidog as his original mum had him from a pup (he was almost a year old), and said she couldn’t cope with him as “he had never had enough”. Then another mummy was interested, adopted him and because he “chewed something off the fridge”, called the rescue centre that night to take him back. We all sense he was in a crate for long periods, too long, and has a fear of corners and being closed in. So there was definitely some neglect there. So, I was totally smitten, with his huge smile, gentle soul and the best hugs. We had a holiday booked so he was adopted and his Gotcha Day is April 19th, one year next week. 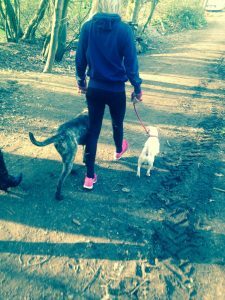 Then life got even better when we found Kettering Dog Walkers and Pet Services. Thank you. Monty now has loads of friends, a girlfriend called Lizzie, is totally in love with Vicky and Nala and has been on two holidays where he’s enjoyed the beach and the pub and so much more. Vinnie Jeffers 4 Years Old (AKA the labra-frenchie) – Younger Brother to Stan. Adopted at 9 months. Vinnie was being surrendered at a local Vets, as his owner couldn’t care for him anymore. He was a bag of bones and ears. can’t pick up food very gently or easily, so I simply got him some large mixing bowls to eat from, he can get his whole head in and use the raised side to scoop his food in. 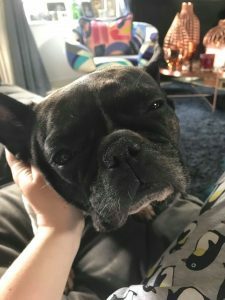 I integrated him with a 7-year-old frenchie, Stan and as they were both boys, they had many scraps and they have to be fed in different rooms. 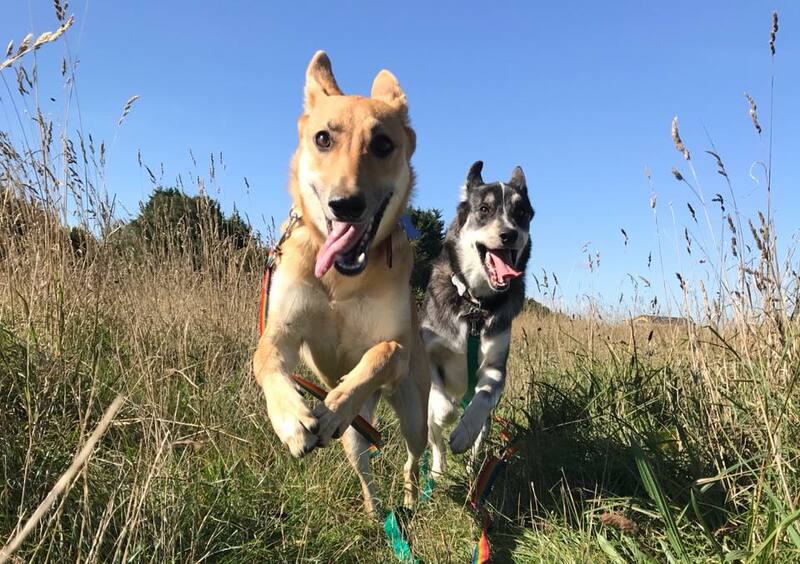 Although this wasn’t the easiest of times and went on for about 5 months, eventually they learned to live with each other and now they interact and play…. But we never mix feeding stations! The most rewarding thing with Vinnie is just to see him not feeling scared and skin and bones, he is now a ‘big boned’ ok slightly overweight dog, but he is happy and has a good life…… he even had his own window seat made for him! Maggie Jeffers 4-5 Years Old (AKA HRH Princess Margaret of Pytchley) – Sister to Stan and Vinnie. No definite age, but 4-5 years old. 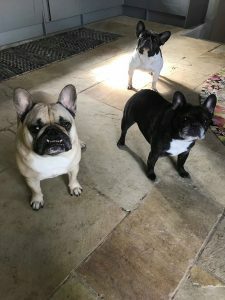 I took some old towels to a dog home and mentioned if they ever had a frenchie I would be interested. Ideally, I wanted a partner for Vinnie around his age, as Stan was moving into retirement and not wanting to interact as much. 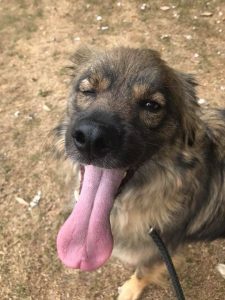 Maggie’s foster team from Lainy’s had done a great job with her, but you could tell she had been moved around a bit, was tired and just wanted a forever home. She melted my heart from the very outset and still does – daily! 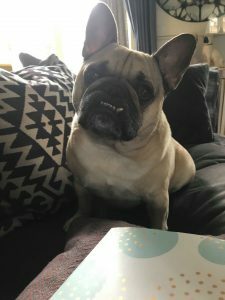 I knew from my first meeting with Maggie that she had some very common frenchie problems that with my previous dog owning helped me understand. She slept slightly upright, as it was the only way she could grasp a full breath, her paws were very red from licking, fur was dull and a thin and patchy, and lastly her ears were so tight inside the canal she couldn’t hear. She also had a growth in one ear. On week three I had a plan with the Vet, we agreed to place Maggie under sedation once. We increased the size of her nostrils to allow more air into her lungs, removed the ear growth and cleaned her ears and lastly deep cleaned her teeth and removed 4 wobbly ones. From that moment she has gone from strength to strength. I also brought two special herbal remedies for her, one is a liquid I add to a treat daily, which clears all airways, oxygenates lung tissue and helps with fewer bacteria inside, thus avoiding illness, which weakens her breathing. The other is a cranberry tablet to stop vaginal scratching; Maggie was used (unsuccessfully) for breeding so seemed to suffer a bit in that area. The once daily cranberry chew has stopped her itching. I was so super nervous about integrating a new dog, but in all honesty other dogs pick up on other dogs, they are clever like that. Both Vinnie and Stan pretty much welcomed her into the home, understanding that she needed the home as much as they do. Vinnie kept licking her ears, which in turn helped me investigate what was wrong, thus removing the growth. We have had a only a handful of snarls and scraps, but nothing major and in all honesty it is dogs sorting the pack order. Within the first month I spent in the region of £600 on her in Vets bills – but worth every penny! The most rewarding thing with Maggie is seeing such a transformation in such a short space of time, her fur feels like Mink and she has filled out and really found her place. The best moment so far was when her nose healed properly and her air waves were clear for air to pass, she now starts to sleep upright, but gradually falls into a lie position and sinks into the deepest sleep, it’s a lovely thing to watch! She is still deaf in both ears, but we now have hand signals and if she is asleep and I move from the room, I wake her and show her where I am so she doesn’t feel abandoned. 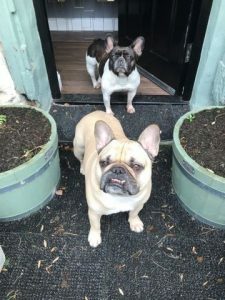 With all my dogs, I try and find the right food, frenchies are very gluten intolerant, so stick to protein where possible, their fur will be amazing. Although pricey, Butternut is the best food I have tried so far!! Would we do it again……. Yes, without doubt, maybe not with a puppy again, but defiantly with older abandoned dogs. If you are considering adoption, go into with your eyes open. 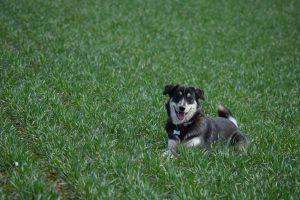 Research the breed or mix of breeds it will really help you understand the dog faster. Given that a dog is being given up and given to you to for practically no money, it is safe to say they probably need something fixing. So be observant and be prepared to fix it. The end result is incredibly rewarding. Remi is a Romanian street urchin who is around 7/8 years old now. Remi came into Lainys Rescue after having suffered an incident which broke her spine and left her paralysed. When she first arrived into foster she was terrified of everything and we took our time to introduce her to life here being pushed around in a child’s stroller. We obtained some wheels and after about 12 weeks she felt confident enough to actually walk in her wheels. She’s never looked back and enjoys her walks like any other dog. As Remi is incontinent of faeces and urine it was impossible to find her a forever family but she captured the heart of her foster family and was adopted. She enjoys playing with toys, chasing after her sisters, long walks, chasing birds and cuddles. 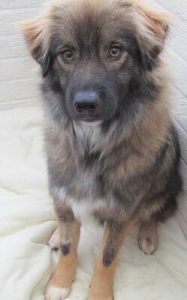 Whilst browsing the Dog’s Trust website I spotted a sad looking individual named Bruno. The Trust said he was a rescue dog from Romania, aged about 10 months. It said he needed an owner who could show him that the world is not such a terrifying place . Needless to say, I felt (over optimistically as it turned out) that I could be that person. The name Bruno had to go. It implied fearlessness, strength of character and this poor soul was neither, so Teddy he became. Teddy had never been inside a house and was petrified of absolutely everything within mine, especially the TV. He was traumatised by the street outside and to this day will only go for walks in this area at the crack of dawn when there are few people about. I have no idea what he suffered as a puppy, but I do know he reacted strongly to boys on bikes, men with walking sticks and sudden sharp noises, so I have to assume that these things trigger memories for him. He has matured into a delightful and loving companion, with a passion for TV, a love of all other dogs and a huge appetite. However, he has always reacted noisily to visitors to the house and would bark for simply ages and show real signs a fear and unease. This was where Vicky came into his life. After I approached her, she visited Teddy several times and simply ate her lunch, whilst he barked around her. After several visits he agreed to share her lunch and accepted her as a friend. 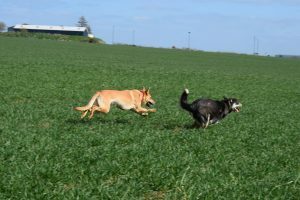 Through his pack walks with Vicky, and lately Nala, Teddy now enjoys the company of other dogs in a safe country setting and knows how it feels to run free and to play. Vicky, Nala and Darrell know how thankful I am for their devotion to Ted and for joy they bring him. He still hates the terraced streets where I live and will probably never erase the terrors of his first months prior to his rescue but seeing him at peace and stretched out on my sofa is beyond price. 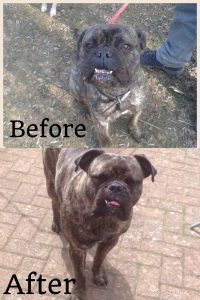 Teddy was rescued from Dogs Trust. 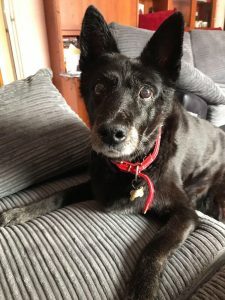 As you know we lost our gorgeous girl Tasha on 6th June 2018. She was 15 and a half, we had had her for 15 years and she was so riddled with arthritis she couldn’t stand on the day we said goodbye. We were heartbroken as you can imagine and we’re going on holiday in a caravan in Norfolk at the end of June, which would have been the first holiday without a dog for many years. The house was so quiet without a four-legged fur baby, more so for Paul who worked from home and he was struggling without Tasha. Our holiday, although lovely, was overshadowed by the fact that Tasha wasn’t with us and we decided then that as soon as we got home, we would start to look for a new fur baby. 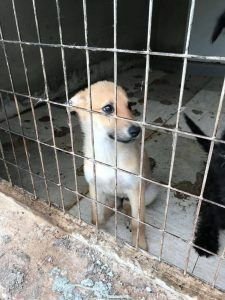 Some friends had mentioned the various animal rescues on Facebook, so we had a look and whilst I was looking I came across Paws On Hearts who are in Spain. We hadn’t a clue what sort of dog we wanted but I knew it wouldn’t be a pedigree one. 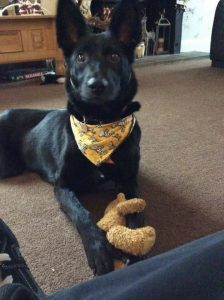 We couldn’t justify spending the amounts they wanted for pedigree dogs when there were and still are so many rescue dogs In desperate need of homes, besides our Tasha was a Heinz 57 and she had been fabulous so a mixture was the type we decided on. 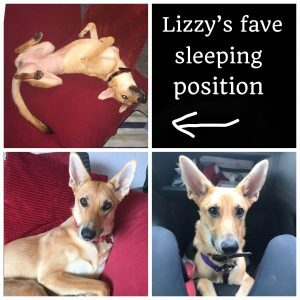 We kept looking at all the various rescues on Facebook then on 9th August 2018 I saw the most beautiful little 7-month-old skinny lurcher ish looking girl with pointy ears on the Paws On Hearts Facebook page, just like our Tasha had. Her name was Lizzie and I fell in love with her instantly. I showed Paul her picture and he said, ‘just ask them about her, don’t say we’ll have her’. I had already messaged to ask. They replied saying she was a Spanish rescue, her passport said she was about 18 months old and was already in England with a foster family. We messaged quite a lot more and sent photos of our garden. We had moved house the previous December and had a nice big enclosed garden, ideal for a young pup with loads of energy! We messaged more with the rescue and with Janet the lady fostering Lizzie. Janet told us she had a couple of her own dogs, several cats, and a few other pets, and Lizzie got on with most of them – she did like to chase some of the cats!! I told them we would take her, and I paid the £250.00 fee for her immediately. They asked how soon we could collect her, and we arranged to meet at a dog friendly pub just outside of Barnsley a few days later. The drive to the pub was agonising, as was the wait in the pub but finally Lisa and Janet arrived with Lizzie. She was absolutely gorgeous with a beautiful face, long legs and a really long tail. We had a little chat with them both then Janet handed her to us. She was quite upset as you can imagine but we promised we would send loads of pictures of her whenever Janet wanted. Lizzie was so good in the car on the way back, Janet said she loved going in the car. Lizzie mostly slept, considering she didn’t know either of us and we had just taken her away from the people she knew it was amazing. Even when we got to our house, she was so good. We had bought some new toys but a lot of the toys we had originally belonged to Tasha, the ones she didn’t play with, well Lizzie loved them. We decided to slightly change her name too, spelling it Lizzy not Lizzie. She had a visit to the vet a couple of days after we brought her home. The vet couldn’t really put an age on her, but we were convinced Lizzy was much younger, about 9 months old. She also had some rashes on her tummy, the vet thought it could be a little contact dermatitis, she suggested washing Lizzy in oat shampoo and adding some ‘Yumega Itchy Dog’ to her food. The combination of both worked a treat and in a couple of weeks her rashes had almost gone. My fingers and hands however were a little scratched and nibbled where she thought the washing of the tummy was a new game. She would try to drink the water and chew up the clothes – she was so funny. House training was a bit tricky, the good weather meant she spent quite a lot of time outside with us, which did help but also didn’t. Lizzy didn’t know to tell us she wanted to go for a wee, and we didn’t know what signal to look out for so the puppy pads and cheap Asda shower curtains over the carpets were a godsend. We took Lizzy to training classes with a chap called Kirk from KRS Dog Training. He trained security dogs and had worked with Spanish rescue dogs previously so was aware of some of the problems we were having. Nothing serious but Lizzy was nipping a lot, and pulling all the time on her walks, we needed for her to see us as pack leaders which she wasn’t. Kirk’s classes were brilliant, Lizzy loved them. She was very wary of Kirk and his daughter to start with but quickly got used to them. At the end of each class they would be let off the lead for a play, Lizzy adored this. 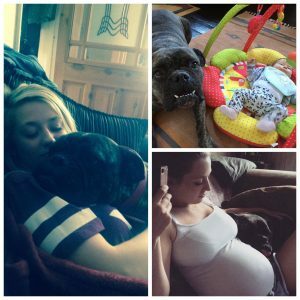 In our class was a Chihuahua called Blue, he was only about the size of Lizzy’s head, but she happily rolled on her back with her legs in the air for him, such a lady! The classes helped us understand how she was thinking and how we needed to adjust our thinking and actions to get her to listen to us and our commands. The training doesn’t just stop when the lessons do. Every day you have to be in charge, be consistent with the commands, reward the good behaviour, ignore the bad (if possible). It’s absolutely not easy but it’s so rewarding, she’s a fabulous little dog, so loving and such a minx. She makes us laugh every day, she makes us curse some days but she makes us so happy and grateful every day that we have adopted her. 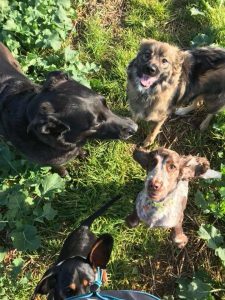 She adores other dogs and her best friend is Monty, another rescue dog who she sees when she is out with Vicky and Nala from Kettering Dog Walkers. You have to be very sure you can devote the time to helping a rescue dog, they have very different problems sometimes but it is so rewarding to know you have saved a little life and given that animal a home. Giving the dog love where perhaps they would never have known what love is. We are even looking at rescuing a brother or sister for Lizzy, She’ll love it. Before we move onto the next gorgeous dog I would just like to share my feelings about the relationship Lizzy has with Monty (collie x featured above). Both Monty and Lizzy were rescued around the same time and both needed some energy burning. 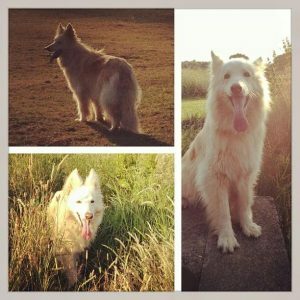 Thankfully both owners used Kettering Dog Walkers or the pair may never have met. Monty was a very cautious dog where as Lizzy was full go on play mode. I had a feeling that Lizzy’s confidence would help Monty and it certainly did. From the moment they met they have been the best of friends since and an hour’s play a day isn’t enough sometimes! Out of all the owners the pair could have been rescued to, of all the county’s (countries even in Lizzy’s case), walkers that could have been chosen they were still destined to meet. Nala, Darrell and I LOVE watching them together. Sometimes Lizzy enjoys gloating when she knocks Monty over! After my first dog died, our remaining dog, Reggie, was very lonely so we decided after a couple months to go and look at getting another four-legged friend. She was smelly, her face was half covered with a muzzle and you could see all her spine and every single rib. So we took her for a walk with Reggie (who is a grumpy old man). As soon as we were out of sight we took the muzzle off because we could see her mouth was bleeding. She had no background because she came into the rescue as a stray with no chip, all we knew was she had picked up a broken rib. We weren’t even sure on her age! Straight away, all she wanted to do was please us. She had something teething issues…dragged the bin out for food, chased the cat, climbed over the garden wall. And whenever we let her off the lead it was like she was a stray again. She just switched. But a little bit of love, a little bit of exercise and 2 sessions with a dog trainer. She is the most loving, caring and protective dog. She was around my daughter from birth and I have never once been worried about her. If you fall over she tries to pick you up. She barks on command. She walks to heel off the lead. She stops and waits until she is told to cross the road. But most of all she is my best friend. I absolutely love watching all my rescue dogs having fun within a pack of dogs. If you’ve been moved by any of the stories, then please feel free to check out the local animal adoption centres below. I can’t thank my friends/customers enough for sharing their wonderful stories and allowing me to do this. Thank you so very much. Address : Lainy’s is solely based around volunteers who foster each rescue animal. During this time Emma and her team rehabilitate for a successful re-home. I advise you check out the facebook page, their website and contact Emma via the info above. Emma fits each animal accordingly and this all depends on the animals needs as well as your own. Please note that you cannot visit dogs in the kennels as it can cause them distress. Best thing to do is check their website/facebook page. If you see any dogs that you’re interested in the staff will arrange a meet up for you. © Copyright Kettering Dog Walkers 2016. Website created by S.C.Agency.